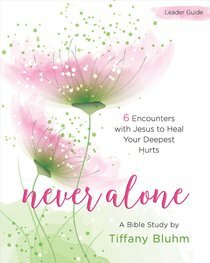 Tiffany Bluhm, author of the Never Alone trade book and Bible study, is a speaker and writer who is passionate about helping women come to know their value and purpose because of a loving, redeeming God. In a style that speaks to women right where they are, she shares insights from a life spent chasing after Jesus while walking alongside women from suburbia to the inner city, jails and brothels, and the slums of Kolkata. Tiffany speaks regularly at conferences and events, and writes for a number of websites, print publications, and popular blogs, including the YouVersion Bible app, Deeply Rooted Magazine , and ScaryMommy.com. She lives in Tacoma, Washington, with her husband and two sons, and blogs at TiffanyBluhm.com.